A comprehensive tutorial of Node, Express and Passport Facebook, Twitter, Google, and Github login or authentication. A comprehensive tutorial of Node, Express and Passport Facebook, Twitter, Google, and Github login or authentication. 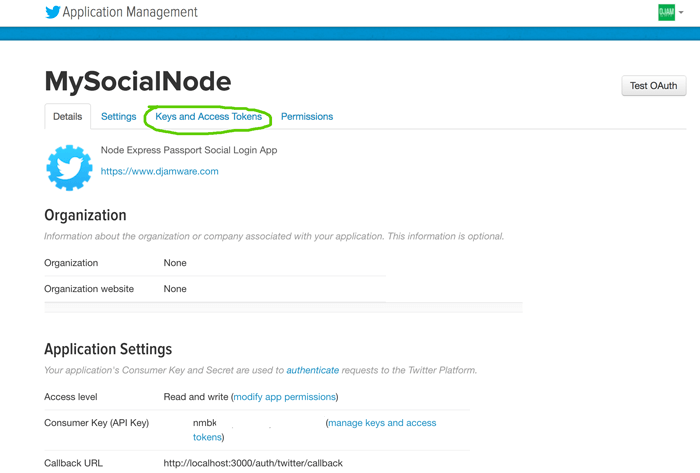 This tutorial shows you how to create multiple social media (Facebook, Twitter, Google and GitHub) authentication (login) using Node, Express, Mongoose and `Passport.js`. This authentication is using OAuth provider which has the different name and authentication keys between Facebook, Twitter, Google and GitHub. If you like to use form-based authentication, we already publish authentication or login tutorial using Node.js, Express.js, Passport.js, and Mongoose.js. The first thing before starting the tutorial is making sure that `Node.js` and it's command line installed and working properly. After `Node.js` installed, open terminal or Node command line then type this command. You will see the version like this. 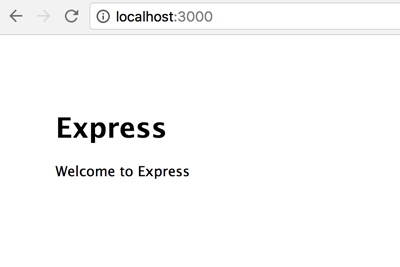 Now, install Express generator for generating new Express application by this command. 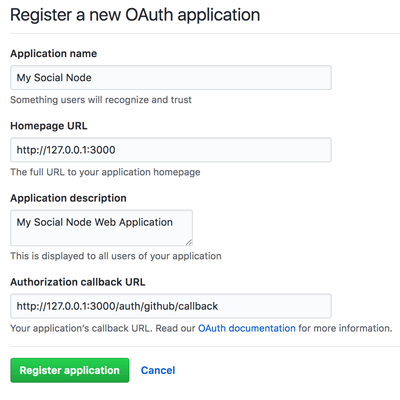 Facebook using APPID and App Secret that use for OAuth provider requirements for authentication (login). 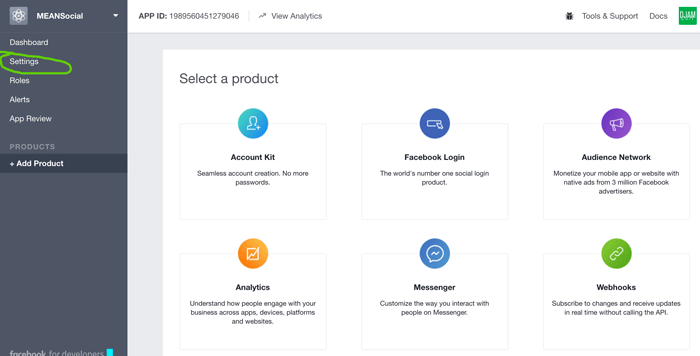 Open your browser then go to Facebook Developer Dashboard. 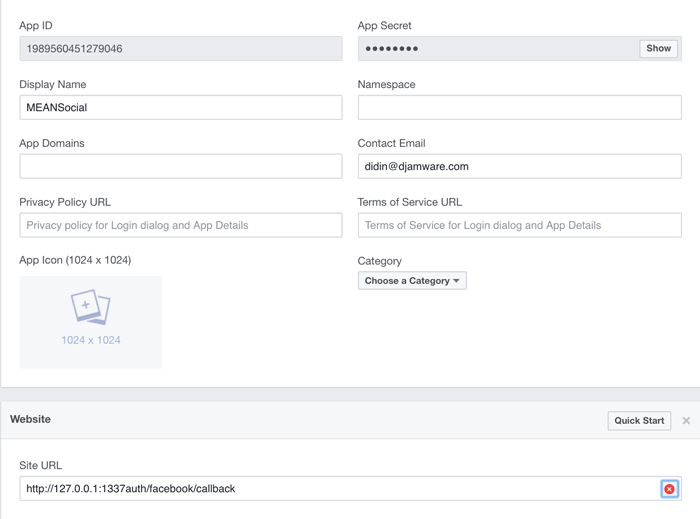 Log in using your Facebook developer account or your standard user account. Click Add a New App button then fill Display Name (ours using `MEANSocial`) and email address. Click Create App ID button, enter captcha then click the Submit button. It will redirect to the Facebook App Dashboard. Click the Settings menu on the left menu. Click Add Platform then choose the website. Fill site URL with the callback URL for OAuth authentication callback URL. Don't forget to write down the App ID and App Secret to your notepad. To get Twitter Consumer Key (API Key) and Consumer Secret (API Secret), go to the Twitter Apps console. Log in using your existing Twitter account. Click Create new app button then fill all required fields. Fill callback URL with your MEAN application URL, ours using "http://127.0.0.1:3000/auth/twitter/callback". Check developer agreement then clicks Create Your Twitter Application button. It will redirect to your new application dashboard. Click on Keys and Access Tokens tab. 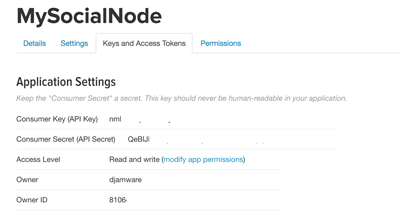 Now, write down the Consumer Key (API Key) and Consumer Secret (API Secret) to your notepad. 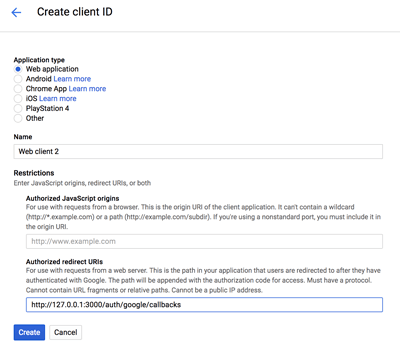 To get the Google Client ID and Client Secret, go to the Google Developer Console. Login using your Gmail account. On the selected project drop down click "+" button to create the new project then give it a name. Click the Create button then it will redirect to the Project API dashboard. Click Credentials menu from left menu then click OAuth consent screen tabs to create product name, just fill product name and email then click save button. Back to Credentials tab then click Create Credentials and choose OAuth Client ID. 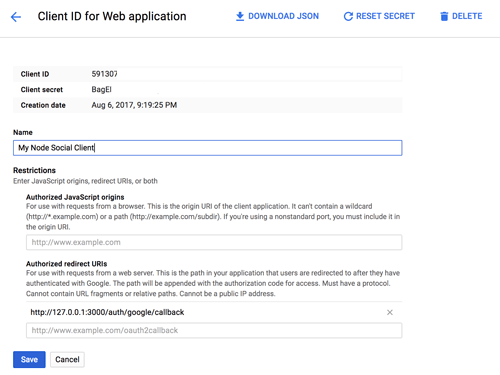 Choose Web Application then fill the Authorized redirect URI with MEAN application URL like previously then click create. Now, you get the Client ID and Secret. Write it down on your notepad. 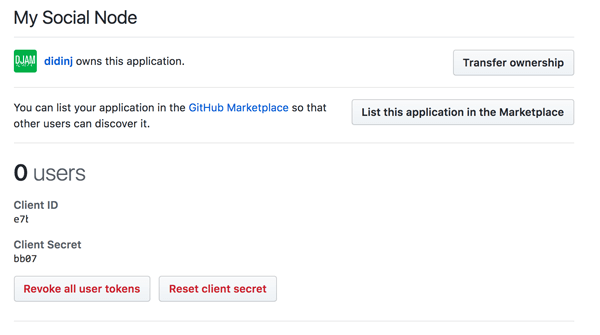 To get GitHub client ID and client secret, go to Github developers. Log in using your GitHub account. Click Register New OAuth Application button. Fill all required fields, use your MEAN application URL for Authorization callback URL then click Register Application button. Now, you get the Client ID and Client Secret. Write down to your notepad. Now, we will create Node, Express and Mongoose Web Application. Open terminal od Node command line then types this command. That command creates new Express web application with using `pug` view template, this different than the previous tutorial that uses `ejs` or `jade`. Here's the output from that command. Now, do as terminal output command. Type or paste this command. Next, check if the Express web application working by type this command. Open the browser then go to `http://localhost:3000`, you will see this page if everything is working properly. Now, we will add Mongoose module and dependencies. Stop the app by press `CTRL+C` key. Type this command to install Mongoose the modules and dependencies. Also, install this dependency to make easy query find or create data. Create a connection to the MongoDB database. Add this lines of codes after the require section. Create User model and models folder by typing this command. Open and edit `User.js` model then add this lines of codes. Install the following Passport, Passport-Facebook, Passport-Twitter, Passport-Google and Passport-GitHub dependencies, and modules. Also, we need to install Express Session dependencies. Now, add Passport and Express Session require to `app.js`. Then add the use of both requires along with another use method. 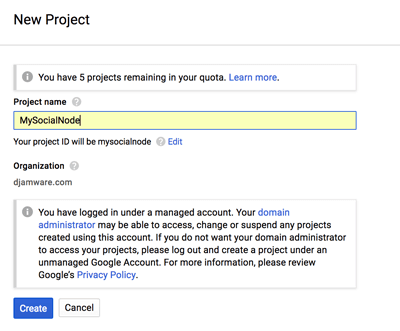 Next, create a folder on the root of the project folder for holds Passport Facebook, Twitter, Google, and GitHub Strategy files. Now, create Passport Facebook strategy file. Open and edit `auth/facebook.js` then add this lines of codes. Create a Passport Twitter strategy file. Open and edit `auth/twitter.js` then add this lines of codes. Create a Passport Google strategy file. Open and edit `auth/google.js` then add this lines of codes. Create Passport GitHub strategy file. Open and edit `auth/github.js` then add this lines of codes. Next, create `auth.js` file inside `routes` folder. Open and edit `routes/auth.js` then declare all required to Facebook, Twitter, Google, and GitHub passport. Add routes for the login page. Add routes for logout from logged in session. Add routes for Facebook, Twitter, Google, and Github login. Next, open and edit `routes/users.js` then replace the default router with this. Create `ensureAuthenticated` function before `module.exports`. Don't forget to register `routes/auth.js` router in `app.js`. Add this lines to `app.js` after another routes variable. Add `use` method after users `use` method. As you see on router files there's a lot of redirect to login page. For this, we have to create a `pug` file inside `views` folder by type this command. Open and edit `views/login.pug` then replace all codes with this. To make styling easier, we have to use Bootstrap. Type this command to install `pug-bootstrap` module and dependencies. Open and edit `views/layout` then add the include for `pug-bootstrap`, so it will look like this. Open and edit `public/stylesheets/style.css` and make it like this. One thing left, is a user page that should open when authentication success. Type this command to create the page. Open and edit `user.pug` the file then adds this lines of codes. 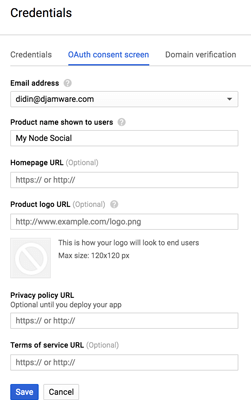 Now, you can run again the application on the browser then go to restricted page `http://127.0.0.1:3000/users` it should redirect to the Social Login page. After successful login with one of Social authentication, then it will return back to user page then display the username on the page. Yeah, I know this a little bit complicated. For that, please give us your suggestions, critics or any problem report under comments below for this tutorial. If you need the working example, you find on our GitHub.